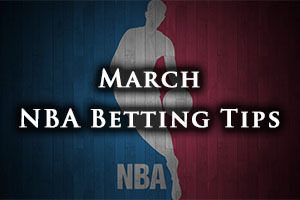 If you think that Sunday is a day of rest, banish those thoughts and get set for a day of exciting NBA betting action. There were a few games on Saturday but this week, the real action takes place on Sunday so make sure that you are in the right place to make the most of the weekend action that is being served up in the leading basketball league in the world. The Hornets probably caught the Hawks at a good time; facing them a day after the Atlanta team celebrated grabbing the no 1 seed in the Eastern Conference. The Charlotte side grabbed a 115-100 win over the Hawks. The Warriors were road winners, defeating the Bucks by a score of 95-108 in Milwaukee and the Trail Blazers held on in a lengthy one in Portland, winning by a score of 120-114. The Bulls had a straightforward win against the Knicks, the Chicago side notching a 111-80 home win while the Jazz were also home winners, defeating the Thunder by a score of 94-89 in Utah. The Rockets are on the verge of booking their place in the playoffs but with James Harden in the running for the MVP, don’t expect the team from Houston to ease up just yet. They have an additional incentive to put the Wizards to the sword in this once because if they do, it will be the first time that they have managed to sweep the series since 1989. The Rockets hold a 49-23 record going into this game and this includes a 22-13 record on the road. The Houston side have a winning streak of 3 games, which includes a Friday win over Minnesota by a score of 120-110. The last 10 games for the Rockets has resulted in a 7-3 record. The Wizards are on a 41-32 record for the season so far and they have a 26-11 record at home. They won their most recent game, a Friday night home win against the Hornets by a score of 110-107. This win ensured that the Wizards have a 6-4 record in their last ten outings. For average points scored, the Rockets lead by 103.5 to 98.4 and for average points allowed, the Wizards lead by 97.8 to 100.2. Both teams have a number of players with various injury concerns, so there could be some changes to what you would normally expect from these teams. Dontas Motiejunas, Patrick Beverley, Terrence Jones and Kostas Papanikolaou are all expected to be out for the Rockets while Corey Brewer and Josh Smith are being monitored closely. Kris Humphries and Garrett Temple are doubts for the Wizards while DeJuan Blair and Bradley Beal are being monitored closely. Taking the Houston Rockets with a -2 handicap, at odds of 1.90, is likely to be a good bet for your Sunday activities. Bet Now! The Heat never had too much fun on their recent road trip and you get the feeling that they will be more than happy to get back to their home comforts. The Friday night defeat in Atlanta, losing by a score of 99-86, would have been particularly painful as they had to watch the Hawks celebrate clinching the top seed in the Eastern Conference. Some teams get annoyed at that sort of situation while other teams use it as motivation to push on themselves. It will be interesting to see how the Heat respond on Sunday. The Heat take on the Pistons with the team from Detroit holding a 28-44 record at this point of the campaign, which includes a road record of 13-23. The Pistons are on a winning streak of 4 games, including a Friday night win in Orlando by a score of 97-111 and they hold a 5-5 record in their last 5 games. The Heat have a 33-39 record in their last five games which includes a 17-18 record at home. The Friday night loss in Atlanta sees the Heat with a 5-5 record in their last 10 games. With respect to average points scored, the Pistons lead by 98.3 to 94.5 and for average points allowed, the Heat leads by 96.7 to 99.6. The Pistons could be without Greg Monroe and Shawne Williams while the Heat are closely monitoring the fitness of Shabazz Napier, Dwyane Wade, Chris Anderson and Hassan Whiteside. Taking the Heat at -3, at odds of 1.90, should be a good bet for Sunday. Bet Now! The Mavericks have been having a tough time of scoring points of late and with Monta Ellis looking like a doubt for the Sunday game in Indiana, they could be relying on their squad to pull together and all play their part. The Mavericks have a 45-28 record going into this one and this includes a 20-16 record away from home. They lost their most recent game, a 94-76 loss in San Antonio on Friday night and this leaves them with a 5-5 record in their 10 most recent games. They take on a Pacers side with a 31-41 record this season and this includes an 18-18 record at home. The Pacers also lost in their most recent game, a Friday 111-107 loss in Milwaukee and the Pacers have a 3-7 record in their last 10 games. For average points scored, the Mavericks lead with a a 104.2 to 96.8 record and for average points allowed, the Pacers are better off, with a 97.3 to 100.9 record. The Mavericks have doubts over JJ Barea and they will give Monta Ellis as much as time as possible to see if he is fit and available for this game. Richard Jefferson is also a doubt for the Mavericks. For the Pacers, Paul George remains absent while Rodney Stuckey is a concern and David West is being monitored closely. Taking the Mavericks with a +1 handicap, at odds of 1.90, should be a good way to make the most of your Sunday. Bet Now!